According to Yahoo's Flurry analytics: "90 percent of consumer's mobile time is spent in apps." If you do not have an app for your business, you are losing a grip in the current competitive market. Mobile marketing is growing by leaps and bounds which makes businesses to adopt mobile marketing concept or get overpowered by the competitors in the market. When it comes to India, one should start with android app development India search to get ahead in the market competition. How impactful Android Development in India is in the Indian Market? The market is already becoming a digital competitive market where missing a single aspect related to reaching your audience means killing your business. Having an app is a necessary step for a business owner because you need to be there where your target audience is. It has been mentioned in reports that the majority of mobile users are using varied of apps for different purposes. Android is an open source platform and has a cutting edge over other competitive operating systems. Investment in android app development is comparatively less with high ROI. This platform encompasses simpler inter app integration by providing multiple feasible tools. Android Operating system performs on Software Development Kit (SDK) and it helps in minimizing the cost of licensing and development. SDK develops apps for business, gaming, informative and many more in a much easier way. The UI incorporated in android operating system is customized and opens gate for several opportunities for developers to create a better experience at the client side or the front end. Better & easy UI options makes android app more engaging for the consumers. Top android app development companies in India are dedicated in providing a better experience to the consumers as the market in India is flourishing in terms of app development platforms and it is a suitable time for the companies to cater the needs of their users. The market is dominated by Android as it covers 82% market share in smartphones market. The prime reason for such dominance is solving customer challenging ability that eventually increases worth of your business. An android app development company in India helps in providing digital assistance to your business that improves revenues and helps in meeting business goals effectively. Hire Android App Developer in Delhi because Delhi has a pool of skilled app developers who can help you to get the best app for your business. Having an app will reduce the cost of communication with your target customers. In the same manner, there are several android mobile app development India benefits. Increased demand for android developer delhi ncr is multiplying with the growing business opportunities in the region. 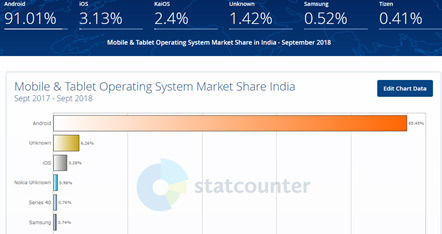 In Delhi NCR, there are maximum smartphone users having Android operating system compared to iOS. One should have a proper understanding of the requirements and needs of the target customers while coming up with the idea of having an app. If you are looking for one of the best android app development company in Delhi, you need to rely on the one that offers you not only the ideas of android app but a complete execution plan. Choosing right resources enhances the performance and also helps in achieving your target.